Lonsdor K518ISE Key Programmer for all makes will be released in the end of October. 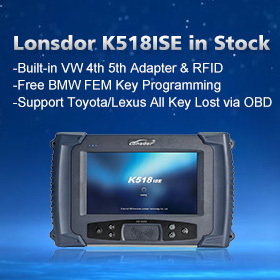 Lonsdor K518ISE is built-in Volkswagen 4th 5th adapter and Chip & remote detection module. Also Lonsdor K518ISE can program Toyota/Lexus smart key all key lost via OBD by working together with extra SKE-LT Smart Key Emulator. Besides Lonsdor K518ISE can adjust odometer on more than 10 car brands. K518ISE nice features: 1) Comes with capacitive touch screen. Volvo (S40, S60, S80, XC60, XC90, C30, C70, V40, V60, V70) key programming. Toyota/Lexus: smart key all key lost - via OBD ( without dismantle) BMW CAS3/CAS3+/CAS3++: direct OBD programming BMW CAS4/CAS4+: dismantle & read data programming 16 -New Maserati: smart key programming 16 -New Ford: smart key programming Hyundai / Kia 46/47/8A smart key: PIN code reading via OBD, all key lost included. Renault ( Megane, Koleos, Scenic) without PIN code key programming VAG group 4th & 5th immobilizer system Ferrari (458, F12, F149): direct OBD programming Peugeot /Citroen: two ways to read PIN code & programming, all keys lost included. Lonsdor K518ISE odometer adjustment car list: VW, Porsche, Ford, Jaguar, Land Rover, Mazda, Audi, Renault, Hummer, Hyundai, Kia... Note: more high-end cars will be updated very soon. How to use Lonsdor K518ISE to program Toyota/Lexus smart key all key lost? Lonsdor K518ISE can program Toyota/Lexus smart key all key lost via OBD by working together with extra SKE-LT Smart Key Emulator. Black: SKE-LT-DST40(94/D4) -Supports 94/D4 smart key. Red: SKE-LT-8A(88/A8)-Support 88/A8 smart key. Green: SKE-LT-DST80(98)-Supports 98 smart key. Blue: SKE-LT-8A(A9)-Supports A9 smart key. After binding completed, the system will indicate "Binding successful”.